The latest Godzilla movie is known as the "Godzilla Resurgence" in English and in Japanese it's known as Shin Godzilla. The movie is directed by Hideaki Anno and Shinji Higuchi. It's produced and distributed by Toho pictures. Since this is the first ever Japanese Godzilla movie in the last 12 years, the rare art pieces which were used for the movie is on display at the Hokkaido Museum of Modern Art in Sapporo’s Chuo in Japan. The art exhibition is known as 'Godzilla at the Museum: Vision, Art & Design in Japanese Sci-Fi 1954-2016'. More than 700 pieces of items are on display which includes the Godzilla suits, blueprints, photographs, screenplays, design drawings and miniature models of godzilla's used during the movie. Most of the items on display are being displayed for the first time. The museum has been preparing for this art exhibition for the past five years with the help of Toshiko Miike(special effects production designer). 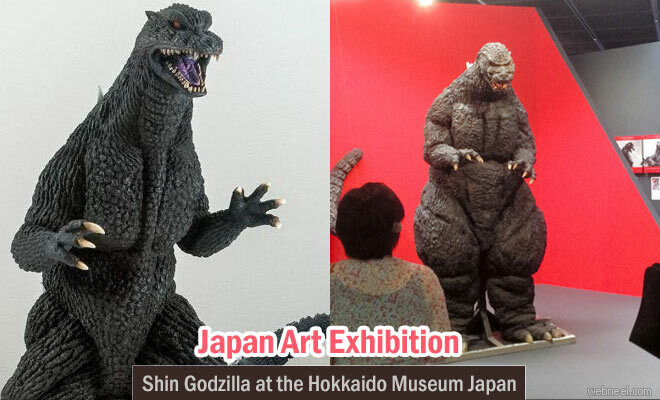 You can visit the Godzilla art exhibition till Oct 23rd . The mueseum is open from 9:30 am till 4:30pm. The museum is closed on Mondays(except on National Holidays). Entrance Fee is $12.80(1,300 yen) for adults.